World Surf League (WSL) Big Wave Tour (BWT) is placing the Nazaré Challenge in Nazaré, Portugal on Green Alert to commence on Saturday, February 10, 2018. NAZARÉ, Portugal (Wednesday, February 7, 2018) – The World Surf League (WSL) Big Wave Tour (BWT) is placing the Nazaré Challenge in Nazaré, Portugal on Green Alert to commence on Saturday, February 10, 2018. Praia do Norte (North Beach), a break notorious for its powerful waves and dangerous whitewater speeds, has seen monstrous waves this season and now event organizers are tracking conditions favorable enough to run the highly-anticipated competition. 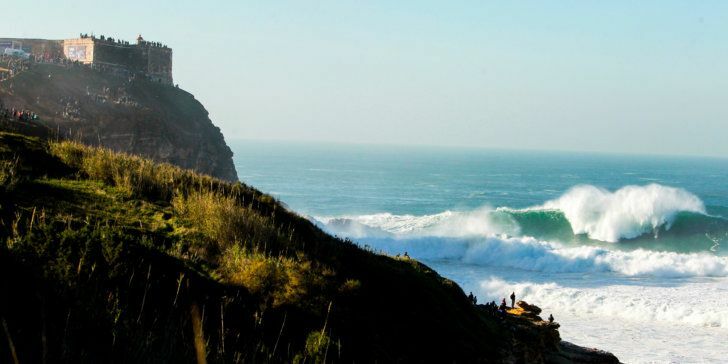 The second-ever Nazaré Challenge in Portugal will see the world’s best take on some of the heaviest waves in the world. Defending event winner Jamie Mitchell (AUS) and the men’s big wave field will be put to the ultimate test as they battle the infamous break that has long been considered inaccessible to paddle-in-surfing. Kai Lenny (HAW), current Big Wave Tour rankings leaders, will look to improve his 13th place finish at Nazaré. The 2017/2018 WSL Big Wave Tour has completed its first two events of the season with Lenny winning the Puerto Escondido Challenge in Mexico, and Ian Walsh (HAW) and Paige Alms (HAW) taking out the Pe’ahi Challenge in Hawaii. Formed in 2009, the Big Wave Tour joined the WSL in 2014 and has produced historic performances at never-before-contested venues such as Nazaré in Portugal and Pe’ahi on Maui’s North Shore. Monitoring swell systems and weather patterns throughout the season, the Big Wave Tour only runs events when surf reaches the 30-foot-plus mark, mobilizing on 72 hours’ notice with an international field of Big Wave men’s and women’s athletes. XL to possibly XXL NW swell is developing for Nazare on Saturday the 10th thanks to a strong, double-barreled area of low pressure now stretching over Greenland. Model guidance indicates that wind of 40-45 knots will develop in this fetch over the next 12-24 hours, with seas of 35-40 feet also expected to develop just east of Greenland. At this point, we’ll look for building, longer period NW swell through the morning on Saturday, with 20-35’+ faces. The swell looks to peak from around midday and hold over the afternoon with solid 25-35’+ faces and occasional sets to 40’+ faces. There will also be some short period NW swell running in the morning, which will give the surf at least somewhat of a jumbled feel, but that short period swell will ease through the day. Wind, while not ideal, does look manageable. Offshore to side-offshore flow from the NE to NNE is currently expected in the morning in the 10-15 knot range, trending to side shore north at 15 knots+ from late morning through the afternoon.Surfline. The 2017/2018 WSL Big Wave Tour is proudly supported by Corona, the Official Beer of the Big Wave Tour (excluding the US), and Quiksilver Airlift, the Official Inflatable Vest of the 2017/2018 Big Wave Tour. The 2017/2018 Nazaré Challenge competitor list will be released closer to the event start. Please check back at WorldSurfLeague.com for updates.